Looking to Buy Aspire CF VV Battery? The Aspire Carbon Fibre CF VV 1600mAh Battery (Carbon Fiber / Variable Voltage) battery is a very powerful and very high quality eGo style & variable voltage battery. The Aspire Carbon Fibre CF VV 1600mAh Battery are unique - they are the only truly high quality eGo style batteries on the market at the moment in Australia Melbourne. 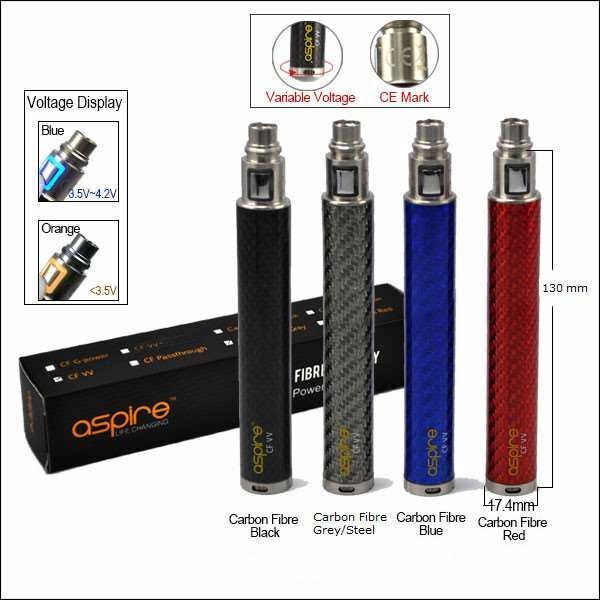 The Aspire Carbon Fibre CF VV 1600mAh Battery are high-end variable voltage batteries and belong to the Aspire CF Battery series. The Aspire CF VV 1600mAh Battery are so much better than any other eGo batteries currently on the market, in terms of build quality - look & performance, that we have stopped selling competing product in a similar price range. We will continue to offer our customers to Kanger EVOD because of its good build quality and lower price point. The Aspire Carbon Fibre VV 1600mAh Battery feature stainless steel endpoints, a metal button, and a gorgeous carbon fiber coated tube. If you are interested in pairing the Aspire Nautilus Mini with a pen style battery - we recommend using the Aspire Carbon Fibre VV 1600mAh Battery for a stunning combination both in look and performance. Aspire have set the new benchmark in eGo Batteries. Variable Voltage and a massive 1600mAh capacity the Aspire CF VV Battery has new technological advances not seen in eGo Batteries before. The ASpire CF VV has a floating Centre Pin for flawless connectivity with anything screwed onto it is just one of the great new features of this battery. 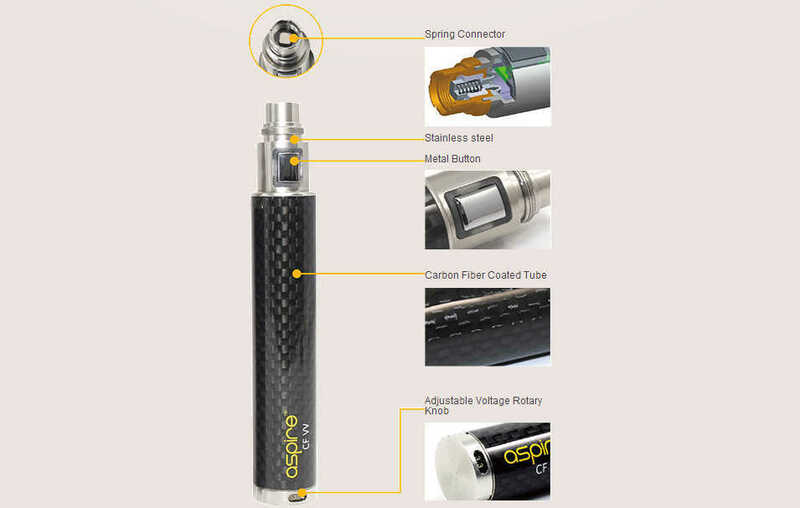 A Carbon Fibre body for a sleek look and tough exterior makes the Aspire CF VV Battery stand out from the pack. Smooth as Silk rotary knob to adjust voltage - definitely best in it's class. To lock/unlock the battery, simply click the button 5 times wihin 2 seconds. The LED will blink 3 times (both blue and orange lights) and the button will illuminate Blue when active and ON. Repeat this procedure to turn battery OFF. Please note, no charger is included. You can find a suitable charger here. eCig Battery Charger not included, please use one of our USB Fast chargers specially designed for e-Cig Batteries.